Health researchers and institutions that prioritise publication rates and “stacking their CVs” ahead of the needs of Indigenous communities are perpetuating post-colonial exploitation, a leading Canadian Indigenous researcher says. 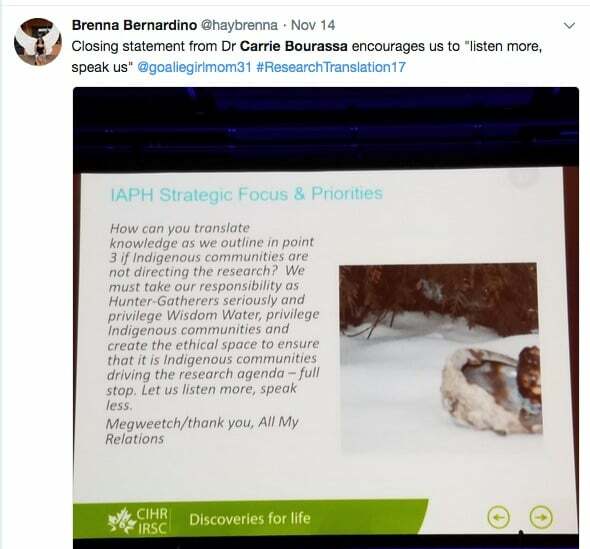 Dr Carrie Bourassa told a national Indigenous health research translation conference last week that fly-in fly-out “helicopter research” and other unethical practices were still exploiting and marginalising some First Nations, Inuit and Métis peoples in Canada. She said research is an inherently political act and plays a key role in self-determination. 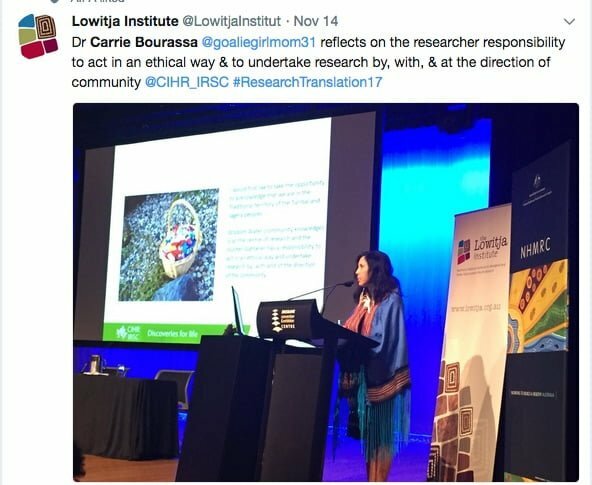 “All of you who undertake research, you’re hunter gatherers,” she told delegates at the 6th National Health and Medical Research Council (NHMRC) symposium on research translation, co-hosted in Brisbane by the NHMRC and the Lowitja Institute. 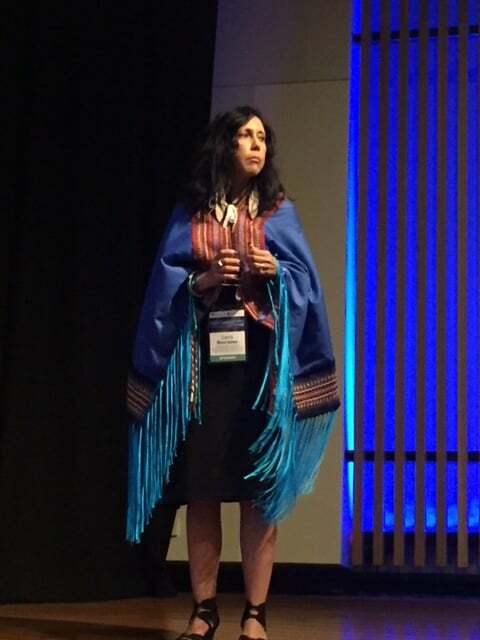 In her keynote address, Bourassa, who is Métis and belongs to the Riel Métis Council of Regina Inc, also challenged the notion and impact of “cultural competence” in the health system, saying it masks inherent systemic racism and there is no evidence that training works — “we don’t have appropriate evaluation models”. She said racism is the biggest social determinant of health in Canada and is literally “killing” Indigenous people in Canada. Later speaking to Croakey, she referred to the shocking case of Brian Sinclair, a 45 year old Indigenous man who died while waiting for care for 34 hours in a Winnipeg emergency room. His tragic death echoed many of the issues raised in the 2014 death in custody in Western Australia of 22 year old Yamatji woman Ms Dhu. Bourassa was earlier this year appointed Scientific Director of the Institute of Aboriginal Peoples’ Health, one of 13 organisations that make up the Canadian Institutes of Health Research (CIHR), and the first to be located outside a major urban centre. Prior to that, she spent 15 years as a professor of Indigenous health studies in the Department of Indigenous Health, Education and Social Work at the First Nations University of Canada in Regina. She told delegates that gaining academic tenure and taking up her new appointment had raised significant and serious issues for her around ethical research, and how she could ensure that her work “serves community” rather than the institutions for which she works. That tension came up elsewhere at the symposium, including in one panel session on Courageous Conversations (as reported in this article). Talking about the need to build relationships with communities over time, Bourassa said researchers “can’t expect to walk into a community with a research agreement in your hand and think that is how you build a relationship”. “It’s an ever-evolving process, it’s not about stacking your CV, not about the number of publications,” she said. As a result, she said the CV of an ethical Indigenous researcher and/or academic will inevitably have to look “very, very different” to that of another researcher, and will likely create “friction” with their institutions. The challenge was equally for institutions to be open to find ways other than peer review and publication rates to value research, whether it be the time invested in Indigenous communities, or “what else we’re doing with the community that’s really valuable”. “It did cause me a lot of disagreement, a lot of negotiation when I came up for tenure, (about) what that would look like,” she said. But she said she fought on. Bourassa said there remains “a lot of hesitation” among First Nations people and communities about engaging in research because of Canada’s long and ongoing history of “research as exploitation”. She gave one terrible example, only relatively recently revealed, about the so-called nutritional experiments on First Nations children in Canada’s infamous residential schools and among adults in remote communities after the Second World War. poverty stricken communities feeling “beholden” to participate in research because it could bring in money and jobs. See Bourassa’s slide below on some common grievances that she said continue to have an impact. We have some researchers go into the communities, basically take out that knowledge and use it for their (own) benefit. Bourassa outlined a set of standards developed in Canada by the National Steering Committee of the First Nations Regional Longitudinal Health Survey in 1998 that established how First Nations data should be collected, protected, used, or shared. 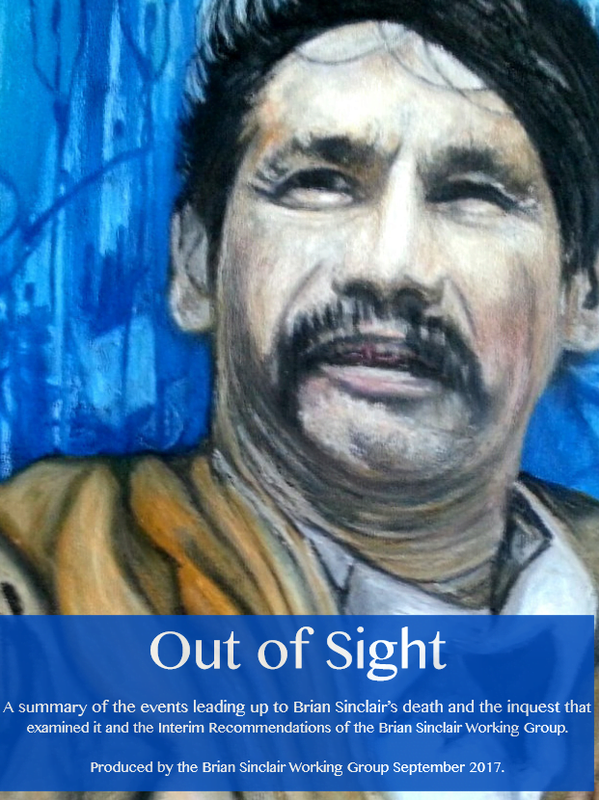 They are known as OCAP – standing for ‘ownership, control, access and possession’ – and were created because there was no law or concept in Western society that recognised community rights and interests in their information. First Nations’ claim to ownership of their own data is not some strange new aberration. On the authority of their own institutions and laws, governments and academics have long possessed and owned data without really thinking twice about it. It is, Bourassa said, “a self-determination approach” to research, where communities can say ‘this is the type of ethical engagement we expect’ and it’s an approach that she says has worked in all her research. But it is not mandated by the Tri-Council Policy Statement on ethical conduct for research involving humans (see Chapter 9 specifically on Indigenous people), a joint policy of Canada’s three federal research agencies including the CIHR. The Tri-Council itself has “absolutely no teeth”, Bourassa said – meaning it effectively sends a message to researchers that “you should have a research agreement and a data agreement, but you don’t have to”. Bourassa also talked about the role of research in ongoing work by Canada’s Truth and Reconciliation Commission, which over six years heard the stories of thousands of survivors of abuse and neglect at so-called Indian Residential Schools. This was one of the country’s “darkest chapters”, according to Prime Minister Justin Trudeau. 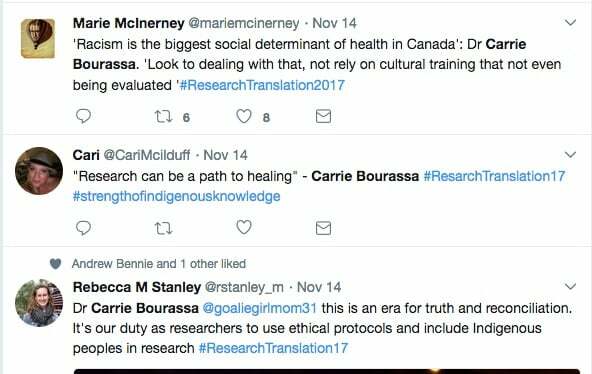 Bourassa said she did not like to use the word ‘reconciliation’ – “I don’t think that we as Indigenous people have to reconcile anything, to be honest” – but she does believe that research “can provide a path to healing”. Provide cultural competency training for all health care professionals. That requires the government to play its part in reconciliation by helping to increase the number of Indigenous professionals not just in health care but also health research, Bourassa said. But she also challenged the focus on training in cultural competence. In a later interview with Croakey (see below), Bourassa referred to this report – ‘Out of Sight – on the death of Brian Sinclair nearly ten years ago and responses to it. The report was recently released by a group of doctors (led by Dr Barry Lavallee) and several academics to highlight “ongoing structural and systemic anti-Indigenous racism in our contemporary health and legal systems”. It describes in distressing detail how Sinclair went to the hospital to have his catheter changed but was left to wait, and to die. Health and security staff assumed him to be drunk and/or homeless, despite interventions from members of the public concerned about his wellbeing, including when he was vomiting. Bourassa said the report has made concrete recommendations about how to address racism in the health system. She will be keeping a close eye on how they are taken up in her region and how other regions react. “That’s something we could really learn from,” she said. 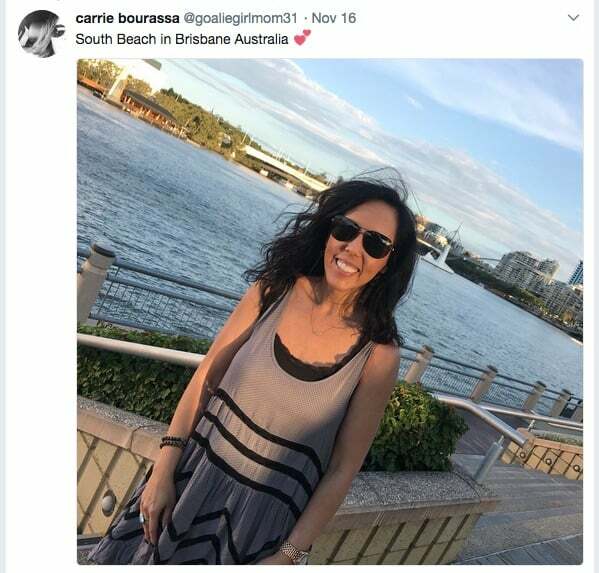 Croakey contributing editor Summer May Finlay interviews Dr Carrie Bourassa about the responsibilities of researchers and research institutions, and the health impacts of racism. You can also hear more in this podcast interview recorded soon after Bourassa took up her position. 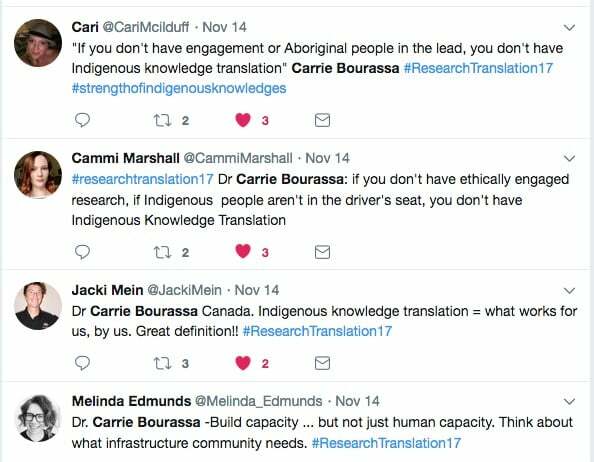 Bookmark this link to follow our ongoing coverage of the #ResearchTranslation17 Symposium.